The staff here at No1 CopperPot Credit Union have gone all out for Superhero Day! Today, these Superheroes will be answering your phone calls. Any local members, feel free to pop in and help yourself to a coffee and a cake! 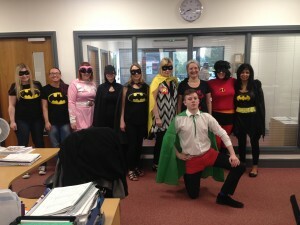 No need to dress up, our members are already Superheroes to us! We have raised lots of money so far. Stay tuned and we will update you all at the end of the day with the grand total!